I‘m not going to beat around the bush with any flowery introductions this week. 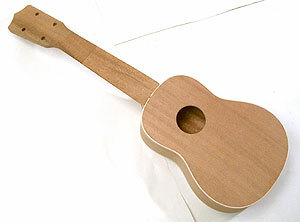 You’re here to see how the uke’s coming along, and that’s just what you’ll find. 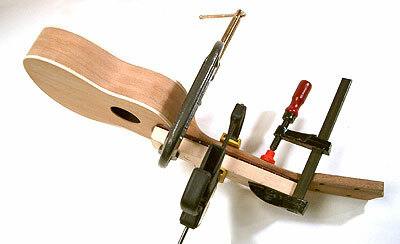 Attaching the neck to the body was a pretty straight-forward affair. 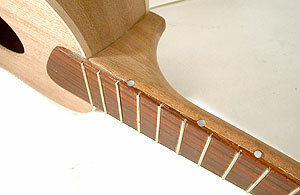 Since the neck is already shaped to provide proper alignment with regard to the face of the neck and the top of the uke, all you have to do is make sure that the neck is not in a twist. I pressed the 2 pieces face down on the bench to make sure that they were flat and held them together with some jumbo rubber bands while the glue dried. This thing is really starting to look like a ukulele. Once that had dried, I trimmed the little protrusion from the back of the neck joint and sanded it smooth. I mixed up some epoxy and glued the fretboard in place using a block of maple between the clamps and the fingerboard to keep things nice and square and protect the it from marring. The kit came with some micro-sized pearl marker dots for the fretboard, but I decided to install them as side-markers instead. I want to do something a little more special for the front markers. This entry was posted on Friday, June 24th, 2005 at 9:04 pm	and is filed under Ukulele. You can follow any responses to this entry through the RSS 2.0 feed. Both comments and pings are currently closed. 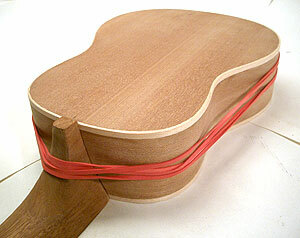 That fretboard wood and body binding really take that project uke to another level… VERY nice. 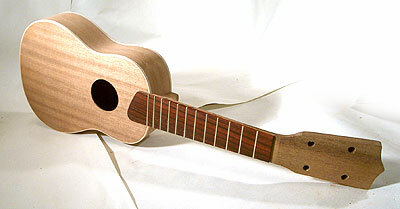 Nice frettage, and also, can anyone tell me anything for an electric ukulele, im trying to make one and there is virtually nothing on the interweb, so please help me! !